At the center of The Traveling Disease is young Pamela, a fatherless girl being raised by her mother, Thelma, a tortured if free spirit given to telling wild tales and lying, a woman who thinks little of abandoning her only daughter on the virtual doorstep of her own parents from whom she has been estranged for years. What follows is Pamela attempting to navigate this new and hostile world, as well as a growing desire to discover what has happened to Thelma, both in the past and in the present. She struggles to adapt to a new life with her grandparents, Evelyn and Roy, who reach out to Pamela in their own clumsy, uncertain ways, while they continue to lament past disappointments over Thelma and present concerns over Thelma’s younger sister Ann Marie, a troubled genius who indulges in self-destructive behaviors. In the course of her search, Pamela befriends Melody, a pregnant teenager who works at the laundromat, and Lloyd, an older man who knows the family’s secrets. Throughout the story, Pamela watches the news bulletins about a local boy who has disappeared in the woods behind his house and memorizes facts about Christopher Columbus, whom she likens to her mother–they both had an undeniable impulse to set sail, a traveling disease that could not be cured. In the end, Pamela rewrites her own story, much like the story of Columbus has been rewritten throughout history, and it is in this revision that she is finally able to reconcile the loss of her mother. Susan Woodring was born in Indiana, and also lived in Illinois, Alabama, and California before her family settled in Greensboro, North Carolina. She attended Western Carolina University and taught for a few years in Caldwell County before earning her Masters in Fine Arts from Queens University in Charlotte. Her fiction has appeared in a number of literary journals, including Quick Fiction, Passages North, Ballyhoo Stories, and turnrow, The William and Mary Review. In 2005, her story, “Thelma by Sea,” was the runner up in the Main Street Rag Short Fiction Contest. As a result, she was invited to submit a full-length manuscript which turned out to me The Traveling Disease. She is the winner of the 2006 Fiction Editor’s Prize at Isotope: A Journal of Literary Nature and Science Writing, and the 2006 Elizabeth Simpson Smith Award for Short Fiction from the Charlotte Writers’ Club. 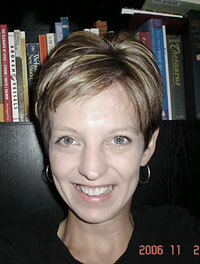 Susan currently lives in Drexel, North Carolina with her children and her husband. 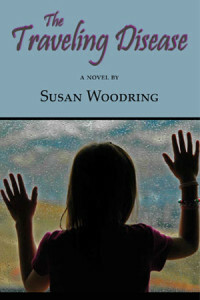 In Susan Woodring’s smart, funny, touching debut novel, we are transported into a world of complex family dynamics replete with sometimes harrowing crises. A real pleasure to read. It’s a rare achievement for a storyteller to take us so completely into the mind and heart of a character that we begin to believe we have become that person. But that’s what Susan Woodring has done in The Traveling Disease. We cry, laugh, hurt and triumph with 9-year-old Pamela as she searches for the people she has lost and tries to figure out who she is and who she might be. It’s a fine book by a talented and wise author. Author of Dairy Queen Days and Captain Saturday. In The Traveling Disease, Susan Woodring gives us an utterly convincing portrait of a young girl’s search for a safe harbor amidst a world of constant disruption. Woodring is a talented writer and this novel is an impressive debut. The fire caught with the second match. My mother waited for the charcoal to grow warm enough, then skewered hotdogs on the broken TV antennas she liked to use as roasting sticks. She held the hotdogs over the grill and watched them cook. It was an old grill, well used even before my mother began preparing our meals on it. The bottom was rusted thin as tissue paper, the lid was missing altogether, and the grill itself was burned black and thick. “Works like a charm,” she insisted. I was eight. I wore my favorite outfit: I’M A ROTTEN KID t-shirt with a faded and half-peeled-off decal of a worm poking its head through an apple, cut-offs, and my mother’s old black boots, the toes stuffed with newspaper. I knew we were moving, but I didn’t want to. When I was very small, my mother and I moved a lot. There had been an apartment in South Carolina and a duplex in Georgia, but I couldn’t remember anything before the large brick house that had been in my stepfather’s family for more than a hundred years. I thought that if I caught a firefly my mother would change her mind. I cupped my fingers and moved them like paddles through the air, trying to gather a few fireflies that were winking in the near dark. They scattered quickly in the stand of trees behind the trailer park. It was early June; the evenings were cool. The dogwoods had just finished blooming and the nut trees had sprouted their baby-leaves, tiny and green. When my mother wasn’t looking, I shoved a just-bloomed periwinkle vine—a short one—into my pocket. My mother blinked against the smoke rising in her eyes as she twirled the TV antennas over the fire. I listened to the highway traffic, blocked from my view by the trailer. The cars drifted easily down the sloping highway. As it grew darker, there were more fireflies. I watched their tiny blink-blinks in the rhododendron bushes, the low branches of baby pines, among the dense stock of crab grass and weeds growing thick in the dirt. I raised my hands through the dusk air, continuing my search. My mother shook her hair from her eyes. Like me, she never tied it back; she let it hang loose past her shoulders. She lifted a hotdog from the fire, reaching for a slice of bread from the plastic bag at her feet. She wrapped the bread around the hotdog, pulling it off its makeshift skewer, then motioned for me to come, but I wouldn’t. Instead, I opened my hand a little, just enough to show her the yellowish light glowing through the spaces between my fingers. After we ate, my mother gathered a handful of dirt from the ground and emptied it on the grill. The fire went out like a storm, and full darkness followed. *** *** ***The backseat of our blue Toyota already held the tomato boxes my mother and I had filled with clothes, my book about the great Admiral, a pocket watch I found last summer at the park, and random odds and ends, what we hadn’t thrown away. We had packed the day before, the last day of the third grade for me though I had missed the party. I settled into my seat, biting the ends of my hair while my mother worked the radio controls. Her tastes in music varied widely though there was a brief time when Eric Clapton alone held her interest. She also liked country and knew all the words to A Boy Named Sue. Joni Mitchell made her cry. There wasn’t a tape deck in the car and my mother, punching at the radio stops, couldn’t find anything she wanted to hear. She finally settled on an oldies station and turned the volume up high even though they only played songs she didn’t like. She hadn’t spoken much the last few days, mostly sleeping on the couch and drinking coffee on the steps in front of our trailer. She couldn’t go to work because the hosiery mill had closed last week. All the jobs were going to Taiwan, she told me. She had worked at the mill since my stepfather Robert died a year ago. With him gone, we had to leave his house—where I’d lived since I was two—and move into the trailer. My mother hated the trailer, but I didn’t mind living there. There was a basketball court for me to practice shooting hoops on and a creek for me to throw rocks into. But now, we were leaving even that. My mother never actually said we were moving—she only told me it was time to pack. She took our dishes from the cabinets, our pillows from the bed, our shampoo and soap from the bathroom, our clothes from the closet, and didn’t talk, just worked quickly, putting things in the boxes she got from the supermarket, and throwing away the things she said we didn’t need. When we got the car packed, she had to tie the trunk closed with twine and the backseat was so full, the back windows were covered. My mother said that was okay—she didn’t intend to look behind her. She nodded vaguely without looking my way when I told her I would miss the basketball court. Now, she listened to the old music, driving with both hands on the steering wheel, her eyes straight ahead. “Let’s go to San Salvador,” I suggested. But my mother said nothing, so I turned to the window and watched the houses swishing by. We passed a white house situated in the crook of the mountain, almost buried beneath a huge oak that hovered over the roof in the freshly dark night. There were lights shining from within and I wondered if it was taco night inside. I announced I was thirsty. My mother waved her hand at me, shushing me. After many miles, when I was almost asleep, she suddenly switched off the radio and tried to touch my hair. I pulled away from her because I wanted all my hair to flow through the open window. My mother sighed. I told her I was hungry. “I want three-bean casserole.” It was something I’d read about in a magazine at school. We were supposed to be cutting out pictures of families, but I saw the article, titled Soup’s Up Summer Style! and I decided to read it instead. I didn’t know what she meant. I thought she was talking about the long drive or the unpacking, or the going to a new place. I thought she meant it would be hard to find another job or hard not to think about Robert—I’d promised her I’d stop missing him. But I answered, “I know.” I waited for her to turn the radio back on. She didn’t, and so on we went, no sounds for company except the rumble of the car engine.